A mastiff puppy will grow up to be a large, powerful dog, and teaching it that biting is not acceptable behavior is essential. Biting is a part of the way puppies play with each other and with their mother, but even young puppies can be taught that biting is not desirable. To make sure that your mastiff puppy grows into a calm, well-behaved adult, begin by teaching it not to bite. Play with your puppy regularly. This will give you a chance to interact with him, and to be consistent with your training. Tap your puppy sharply on the nose when she bites and say “no” in a loud and clear voice. Do not strike her so hard that she is in pain, but make sure that you get her attention when you do this. Grab your puppy by the nose and point at him while repeating the word “no” if he does not respond to the tap. 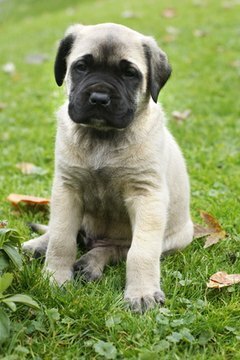 Repeat the corrections in steps 2 and 3 several times to make sure that your mastiff puppy gets the point. Puppies learn very quickly, but do not be surprised if it takes you a few days or even some weeks before your puppy gets the idea. Move to verbal corrections. If you are consistent, your puppy will stop biting even without the physical reminder. Give your mastiff puppy a few chew toys. Puppies need to bite and chew things because their adult teeth are coming in. Giving your mastiff puppy some chew toys can keep him from biting you or chewing up the furniture.